Last month, I was fortunate enough to attend one of SGIA’s quarterly Color Management Boot Camps. Now I want to tell you about my experience and why I believe the boot camp would be beneficial for anyone who works in print. How is the boot camp structured? The quarterly boot camps are three days long; typically Tuesday through Thursday. They are held at the SGIA corporate office in Fairfax, Va. Each day starts at 9 a.m. There are several breaks worked into the agenda throughout the day but lunch is provided on site to maximize everyone’s time. The boot camps are kept to 20 attendees; so they fill up quickly. But the small size allows for more one-on-one discussions and a better overall learning environment. What is covered during the boot camp? While each boot camp is probably structured a little differently, the one I attended started out with a day of discussion on the basics such as color theory, color management strategies, anatomy of the inkjet printer and measurement variables. In the breakout groups, we walked through media configurations and profiling. We used spectrophotometers to verify our prints. We learned about ink limits, curves and spot colors. Lastly, we learned about different software that can be used for verification. View an example of a Color Management Boot Camp agenda. On the third and final day of the boot camp, all attendees will be given a certificate of completion. (Mine is pictured.) But my boot camp was the first one to also offer the SGIA Color Management Certification. Luckily, I’m an avid note taker. Each attendee was given a spiral-bound notebook with the slides of each presentation. But in my boot camp, the slides weren’t always followed exactly or in some cases even used. And here’s one of my criticisms: The content on the slide images in the notebook in many cases are too small to be read anyway. So my advice is take a lot of good notes. I’ve taken the test and many of the answers cannot be found by scanning the slides alone. Yes, I recently found out that I passed the initial test. But that doesn’t award me the SGIA Color Management Certification yet. If you pass the test, Ray emails you to let you know and includes a link to download a test print. Now your goal is to take what you learned during the boot camp and use it in your facility. You need to take that test print and color manage it using the tools and knowledge you’ve acquired. You send that back to Ray and he will measure and verify it. 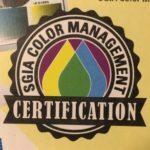 If it passes, you can start using the SGIA Color Management Certification badge! What kind of investment do you have to make? At the time of this writing, the cost to attend the Color Management Boot Camp is $599, but SGIA members will enjoy a 25 percent discount. Travel and accommodations are not included. Lunches are provide all three days of the boot camp. Also as of the time of this writing, there is no additional cost to take the test and return the color managed print to acquire SGIA Color Management Certification. However, if your print facility doesn’t have a spectrophotometer or certain software for calibration and verification, you will need to make some investment in those areas too. And at least one of my fellow attendees indicated that they intended to suggest a RIP change for their shop after attending the boot camp. My biggest takeaway from the Color Management Boot Camp? Allowed me to interact with people who have a common interest to provide customers and clients with great quality prints. Challenged me to work with different RIPs, software, spectrophotometers and strategies to achieve that goal. Most importantly: Drove home the fact that it is indeed possible to attain – and maintain – consistent, predictable, repeatable color. I started out by saying I was fortunate to attend the SGIA Color Management Boot Camp. That’s absolutely true. If you work at a print facility and for a company that is willing to invest in you and your education so that they are ultimately investing in the quality of prints for your customers, I highly recommend attending this boot camp. June 6-8, 2017. 10 slots still available. Aug. 23-25, 2017. 18 slots still available. Nov. 14-16, 2017. 20 slots still available. This looks great and would offer many opportunities to grow in these areas.